This section of the website reproduces large-scale maps categorised by battlefront covering the key battles and offensives fought from 1914-18. 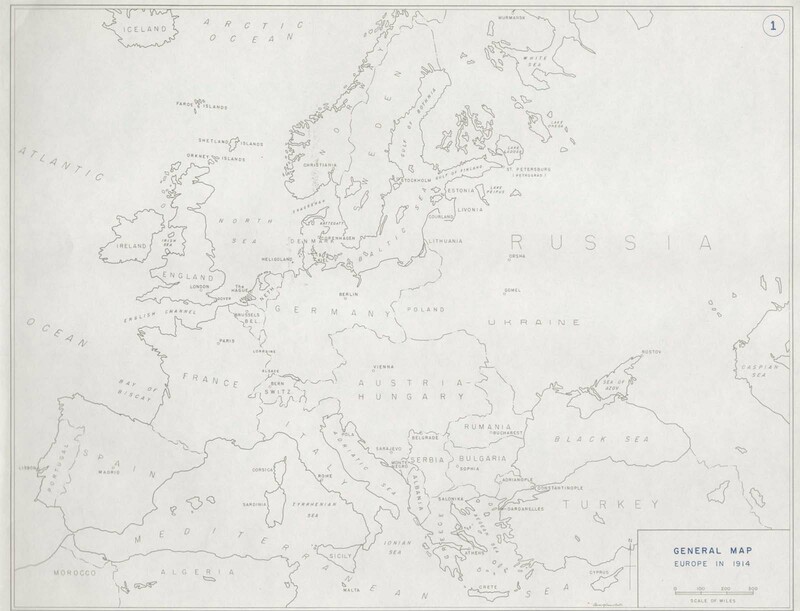 Specifically, this page contains a map showing the layout of European borders in 1914. The sidebar to the right lists each map category available within the section. Click here to view an introduction to the map series. Three versions of each map are available - standard, large and very large. Generally standard files possess a resolution of 800x600 (approx. 70KB); large files 1600x1200 (approx. 140KB) and very large files 4000x3000 (approx. 550KB). Click here to view a collection of maps produced within various publications while the war was still underway. 'Bantam' was a term to describe members of battalions between 5ft 1in and 5ft 4in.